Allogeneic hematopoietic stem cell transplantation (aHSCT) cures a considerable number of patients with myeloid malignancies, but relapse is the most frequent cause of death. We retrospectively studied relapse rate, kinetics, treatment, and outcome after first aHSCT in 446 patients during a 13-year period. 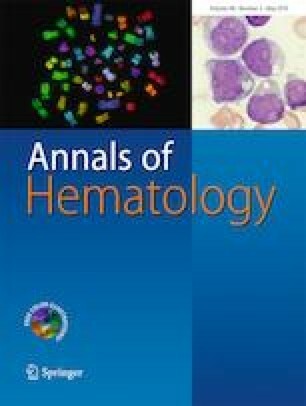 Relapse occurred in 167 patients after a median of 4.6 months (116 hematologic (HR), 38 molecular (MR), and 13 extramedullary relapses (XR)). Median survival after relapse was 8.4 months and 2-year overall survival was 25%. Regarding survival after relapse, type (MR/HR/XR) and timepoint of relapse (</> 12 months), age (</> 50), diagnosis (MDS/AML and sAML), and remission status at transplant (CR and untreated MDS vs. refractory disease) were relevant in univariate analyses, in multivariate analyses timepoint, and type of relapse, age, and diagnosis. One hundred fifty-six patients were treated, most frequently with hypomethylating agents (HMA, n = 109) or intensive chemotherapy (n = 12). Donor lymphocyte infusion (DLI) was administered to 99 patients. Second aHSCT was performed in three patients as first and in 21 as higher salvage treatment. A complete remission (CR) was achieved in 46 patients (30%). Among CR patients, 65% had received HMA and DLI. Median survival of patients achieving CR was 105 months and 2-year overall survival was 80%. We conclude that with HMA and DLI or second aHSCT, a substantial number of patients, who relapse after aHSCT, can re-achieve remission and long-term survival. Techniques to further improve the detection of minimal residual disease are urgently needed because early treatment of MR results in significantly better survival. Esther Schuler performed the research, analyzed the data, and wrote the paper. Sarah Boughoufala performed the research. Christina Rautenberg, Kathrin Nachtkamp, Ariane Dienst, Roland Fenk, Mustafa Kondakci, Ulrich Germing, Rainer Haas, and Thomas Schroeder contributed essential data and approved the manuscript. Guido Kobbe designed the research study, analyzed the data, and wrote the paper. Esther Schuler and Christina Rautenberg received travel support by Celgene, Roland Fenk, Thomas Schroeder, and Guido Kobbe received research funding, lecture fees, and travel support by Celgene. Ulrich Germing received research funding and lecture fees by Celgene.